An angel investor is a person or company that provides capitalPrivate Equity vs Venture Capital, Angel/Seed InvestorsCompare private equity vs venture capital vs angel and seed investors in terms of risk, stage of business, size & type of investment, metrics, management. This guide provides a detailed comparison of private equity vs venture capital vs angel and seed investors. It's easy to confuse the three classes of investors for start-up businesses in exchange for ownership equityEquity vs Fixed IncomeEquity vs Fixed Income. Equity and fixed income products are financial instruments that have very important differences every financial analyst should know. Equity investments generally consist of stocks or stock mutual funds, while fixed income securities generally consist of corporate or government bonds. or convertible debtMezzanine FundA mezzanine fund is a pool of capital which invests in mezzanine finance for acquisitions, growth, recapitalization or management/leveraged buyouts. In the capital structure of a company, mezzanine finance is a hybrid between equity and debt. They may provide a one-time investment or an ongoing capital injection to help the business move through the difficult early stages. Unlike banking institutions that invest in already profitable businesses, angel investors invest in entrepreneurs taking their first steps in business. In most cases, they play an active role in the management of the new business as a way of protecting their investment and helping the owner build a thriving business. Also, some passive investors invest through a fund or Private Placement Memorandum and are not directly involved in the business. There are three ways in which an angel investor can provide funds to a start-up business. The most common way is to offer the business a loan that can be converted into an equity position in the company once the company has taken off. In such a situation, the angel investor will require a 20%-30% equity interest that gives them a voice on the company’s board. The second option is to provide funds through a convertible preferred stock option and still be a member of the company board. The investor then defers the dividend payment for the stocks till a future date. The third option is to get an equity position directly, such as a 20%-30% stake in the company. To safeguard his or her interest, the investor may appoint one or two associates to help in managing the business. The term “Angel” originated from the Broadway theater, where affluent individuals provided money for theatrical productions. The wealthy individuals provided funds that were paid in full plus interest once the productions started generating revenue. The founder of the Centre for Venture Research and also a professor at the University of New Hampshire, William Wetzel, coined the term “Angel Investor” in 1978 after completing a study on how entrepreneurs raised capital for businesses. He used the term to describe investors who supported start-up businesses with seed capital. Silicon Valley is the home of modern angel investors and also home to the largest number of start-ups in the United States. Silicon Valley received 39% of all the $7.5 billion investments in the United States-based companies in Quarter 2 of 2011. Total funding reached $22.5 billion in 2011, $2.4 billion more than the investments in 2010. With platforms like AngelList, start-up companies can pitch directly to potential angel investors and secure funding for their business. Also, there are dozens of boot camps and conferences every year where entrepreneurs meet with investors one-on-one and pitch their ideas. Contrary to popular belief, most angel investors are not millionaires. There are angel investors who earn $60,000 to $100,000. Some are retired entrepreneurs, doctors, lawyers, and successful people in business looking for ways to stay updated with the happenings of the business and earn an income on the side. Furthermore, they make use of their entrepreneurial skills, experience, and networks to help new entrepreneurs launch their business. Unlike venture capitalists, angel investors do not solely rely on the monetary returns for motivation. They are motivated by the persistence of young entrepreneurs to succeed and build an empire for themselves, and hope the money will follow. Unlike venture capitalistsPrivate Equity vs Venture Capital, Angel/Seed InvestorsCompare private equity vs venture capital vs angel and seed investors in terms of risk, stage of business, size & type of investment, metrics, management. This guide provides a detailed comparison of private equity vs venture capital vs angel and seed investors. It's easy to confuse the three classes of investors who invest using money from other investors, angel investors fund entrepreneurs using their own money. The funds may come from a limited liability company, business, trust, or investment fund. Angel investors mostly come in during the second round of start-up financing, after raising funds from family and friends. The funds from angel investors can range from a few thousand to a few million dollars, depending on the nature of the business. The leading sectors in terms of angel investments are technology, healthcare, software, biotech, and energy industries. 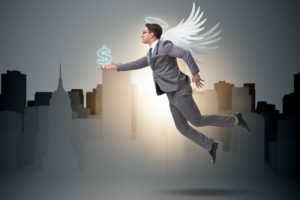 In the United States, an angel investor must have a minimum net worth of $1 million and an annual income of $200, 000 as required by the Securities Exchange Commission (SEC). The most common sources of angel investments are wealthy individuals, crowdfunding, and angel syndicates. The investments may go up to $500, 000 or even more. You can find such investors through referrals, local attorneys, and associations like the Chamber of Commerce. Angel investors may also group themselves into a syndicate and raise potential investments for the group fund. The investors may then appoint a professional syndicate management team to identify business start-ups for possible investment. The team will also be charged with the responsibility of following up the investments and taking an active management role in the business to ensure that the funds are secure. The latest source of angel investment is crowdfunding. Crowdfunding is an online form of investing where a large group of individuals contribute funds to a pool. They may invest as little as $1,000. The money is then used to fund multiple for-profit entrepreneurial ventures. In 2015, there were over 2000 crowdfunding platforms worldwide that raised over $34 billion. An angel investor will look for not only an investment opportunity but also a personal opportunity. They have valuable business experience and may want to have an active role in the management of the business. Before accepting an angel investment, you should understand what the investor brings to the company besides money. Angel investors invest at the earliest stage, while Venture Capital (VC) firms invest later, and Private Equity (PE) invests last (generally speaking). 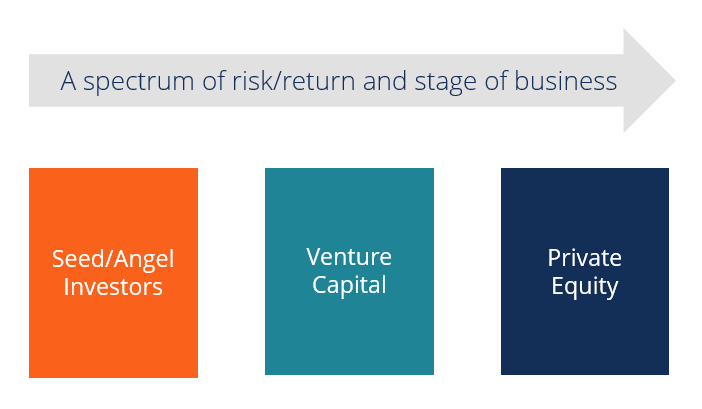 To learn more, see our guide to Angles, VCs, and PE firmsPrivate Equity vs Venture Capital, Angel/Seed InvestorsCompare private equity vs venture capital vs angel and seed investors in terms of risk, stage of business, size & type of investment, metrics, management. This guide provides a detailed comparison of private equity vs venture capital vs angel and seed investors. It's easy to confuse the three classes of investors. The best place to start when looking for an angel investor is to look close to home or on angel investor network sites. Most investors will want to invest in local start-up businesses since it will be easier to track the progress of the business. AngelList, Angelsoft, MicroVentures and Angel Capital Association have an online listing of angel investors who are members in good standing and are looking to invest in potential high-growth businesses. Check out the angel investors listed on the sites and find out what you need to make a pitch. Some sites allow you to send a pitch online at a fee. However, most investors will require you to make a presentation in 20 minutes or less before deciding whether to invest in the business or not. Also, keep track of angel investment conferences in your state that you can attend and meet potential investors. To learn about business funding and investing, CFI suggests the following resources. Private Equity in China – Process, Opportunities, and ChallengesPrivate Equity in China - Process, Opportunities and ChallengesPrivate equity in China is growing and presents a new opportunity for investors. The People’s Republic of China is the most popular destination for the investment of private equity in Asia. Private equity in China accounts for two-thirds of the total investment funds received in Asia. Return on Investment (ROI) – FormulaROI Formula (Return on Investment)Return on investment (ROI formula) is a financial ratio used to calculate the benefit an investor will receive in relation to their investment cost. It is most commonly measured as net income divided by the original capital cost of the investment. The higher the ratio, the greater the benefit earned.